Where most people see something old, Dorrel Harrison sees the potential for something new. 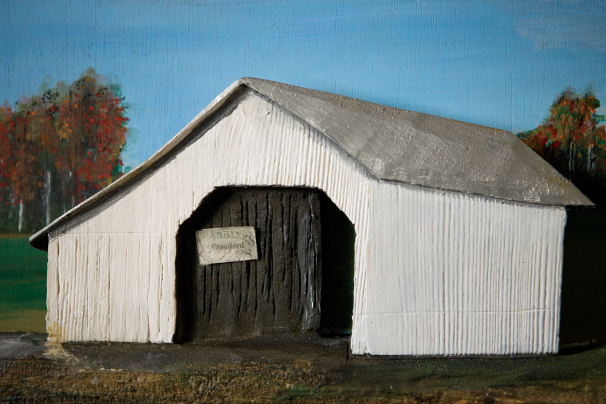 Since 2004, Harrison has used recycled barn wood to create several hundred three-dimensional plaques depicting barns, mills and houses. “I liked the idea of saving the wood, and looking at it and being able to put it to good use,” he says. A self-proclaimed Midwesterner at heart, Harrison spent 33 years teaching health and building a photography business in upstate New York. There, he found inspiration in the work of a craftsman who created barn board “sugar shacks,” buildings used to make maple syrup. Upon retiring from teaching, Harrison exchanged his photography equipment for woodworking supplies. 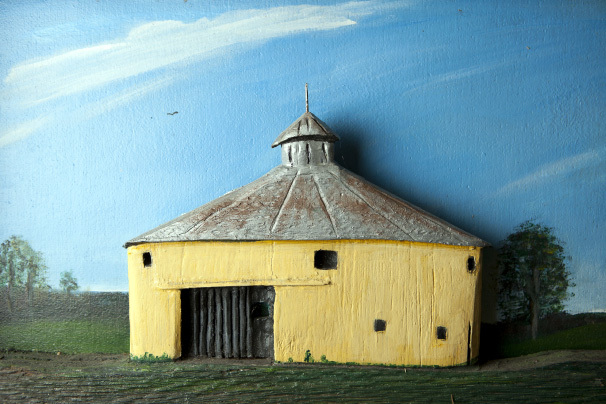 His early works included decorative items based on Vermont’s covered bridges. 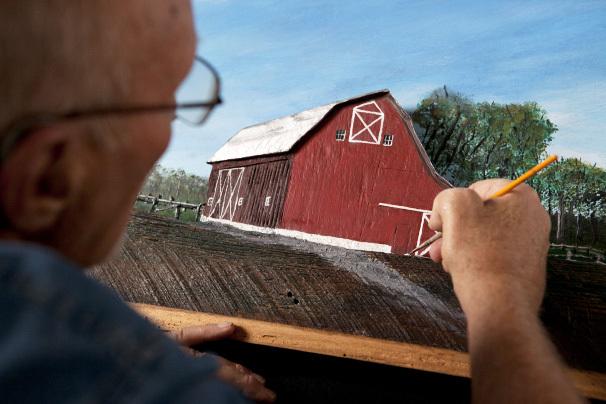 After Harrison moved to Scottsburg in 2003, his son suggested he try making barn plaques. “I thought, well, it would be real environmentally sound to try to take some of this [barn] wood and use it, and in a sense redeem it and bring it back to new life,” Harrison says. The theme of redemption remains central in his life. He speaks publicly about his plaques and the process of redeeming barn wood, which he connects to the redemption he finds through his faith. Harrison’s mission to give old materials a second life has found support from others. He receives donations of wood from dilapidated barns and has bartered to receive boards in exchange for a plaque. “I have not bought any barn board yet,” Harrison says. 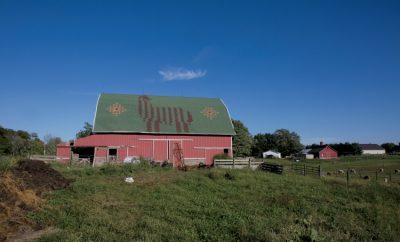 The plaque-making process starts with a photograph of an actual barn, mill or house, from which Harrison creates a template to be traced onto wood. “I look for wood that has grain that matches that particular grain in the photograph,” he explains. He cuts and paints each piece to match the original building. Harrison’s wife and “quality control expert,” Kathy, gives every plaque final approval. Each plaque features a story on the back with details about the building’s history and any special memories related to it. Harrison believes this aspect of his work strongly appeals to his customers. Many plaques also contain a unique personal touch – a group of chickens for a poultry barn, a snowman in a winter scene or some other detail related to the building’s story. Harrison’s handcrafted woodworking business took off after he sponsored a series of county and nationwide classic barn contests offering his plaques as prizes. He was named an Indiana Artisan in 2008. 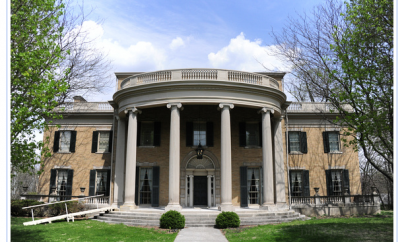 Harrison’s client list even includes Cheri Daniels, wife of former governor Mitch Daniels. 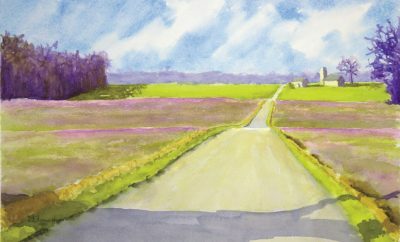 Hoosiers can view Harrison’s work on display in Scott County. A permanent exhibit at Scottsburg’s Mid-America Science Park promotes the county as Home of the Harrison Barn Plaques by featuring approximately 20 plaques depicting local barns. “It doesn’t cost anything to see them,” Harrison notes. Free seems like a pretty reasonable price for a look at a fascinating piece of Indiana’s farm heritage. Want to Buy a Barn? You’ll find Harrison’s Handcrafted Barn, Mill & House Plaques in Scottsburg, located just off Interstate 65 about 30 miles north of Louisville. Prices range from around $59 for smaller gift items to around $200 for a framed plaque. Visit barnmillplaques.com or call (812) 889-3369 to place your order. Those wishing to see Harrison’s work in person can make an appointment to visit his showroom. His plaques are also available at several southern Indiana shops and galleries, including the gift shop at Scottsburg’s Jeeves & Co. Allow at least 2-3 weeks lead time for custom orders; more during the holiday season.